This entry was posted on 10th September 2018 by The Salon Look Girl. Give yourself a deeply nourishing, head-to-toe treatment with the Moroccanoil 10 Year Special Edition; a duo of Argan Oil-infused oils for the hair and body that deeply moisturises, conditions and softens locks and skin. 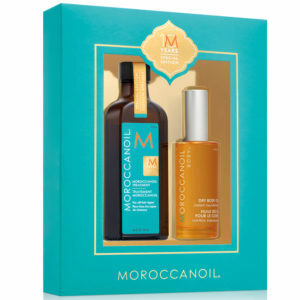 To celebrate the decade-long journey of the brand that pioneered oil-infused hair care and created the global buzz on Argan Oil, the set arrives in a sleek gift box in Moroccanoil’s signature turquoise and gold hues. A luxurious formula that works to renew and repair dry, damaged hair. Harnessing the powers of antioxidant-rich Argan Oil and shine-enhancing vitamins, the nourishing formula helps to strengthen and fortify strands, whilst fighting frizz and effectively detangling for a salon-worthy finish. Expect calm, manageable locks with revived radiance and vitality. A weightless, nourishing oil infused with the signature Moroccanoil aroma that quickly melts into skin, locking in moisture and improving skin tone and texture for instantly hydrated, silky-soft skin. Saturating skin with the nourishing, antioxidant properties of Argan Oil, the dry body oil penetrates skin with a nutritive cocktail of essential fatty acids and natural oils extracted from Olive and Avocado. For Hair Extensions: Use it to help detangle hair, wig and hair extensions. Body Oil: Spray a thin layer directly onto skin immediately after showering and lightly massage in an upward circular motion. Repeat as desired.